Mayor Mary Parham-Copelan is the first female mayor of the city of Milledgeville, Ga., and the second African American mayor to hold this office. Mayor Copelan is a lifelong resident of Milledgeville. She is married with three adult children and four grandchildren. Mayor Copelan serves on many boards, both locally and regionally. 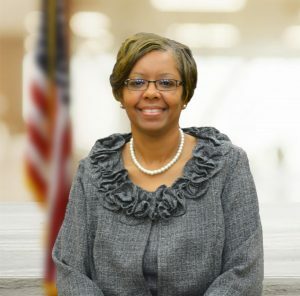 She currently serves as second Vice President of the Georgia Municipal Association for the 6th District region. Mayor Copelan is also part of the National Association of Realtors, the Georgia and International Association of Ministers Wives and Ministers Widows Association, where she has held the position of Executive Secretary at the State level, Statistician, and 2017-18 Key Lady at the State level. Mayor Copelan believes that education is the key that unlocks the door to unlimited possibilities. Let your tomorrow begin today by showing up and being present. The widely known philosopher Plato left a phenomenal quote to remind us that, “The Beginning is the most important part of the work.” We all should start early in life being very inquisitive and gaining knowledge about what makes things function in life. This element of curiosity in us fosters a desire for deeper learning and understanding. Theology philosopher, C.S. Lewis, once said, “You’re never too old to set another goal or dream a new dream.” Always dream bigger than the day before, no matter how old you are!